The wives of the sacrificing Brahmins in Vraja took birth as Jagadisa and Hiranya. 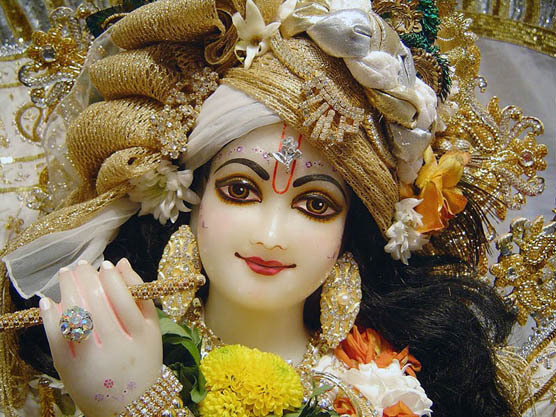 The Lord (Mahaprabhu) asked for and ate their prasad on the Ekadasi day. 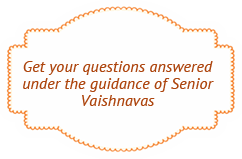 In Vraja there was a dancer named Candrahasa who was very expert in the tasting of rasa. 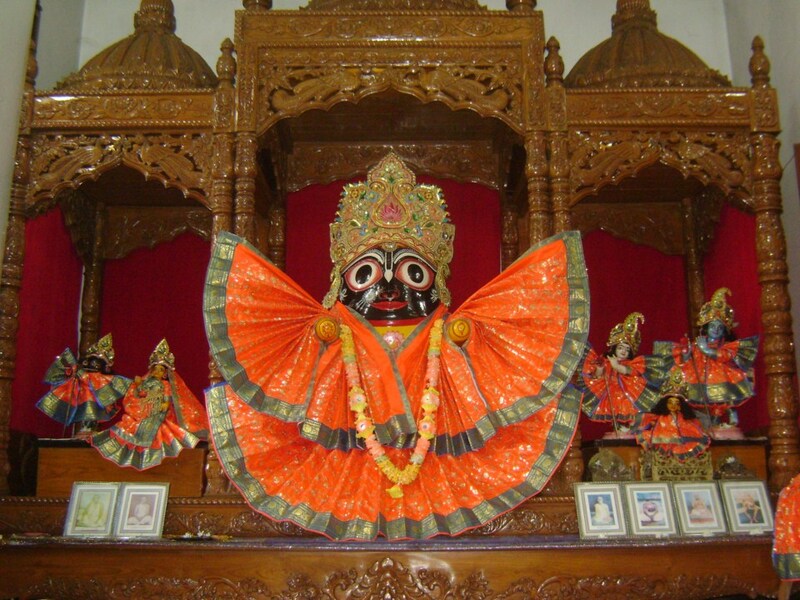 In Chaitanya-lila, he became Jagadisa Pandit who also took great pleasure in dancing for the Lord. Jagadisa Pandit is considered to be simultaneously both Nityananda-shakha and Chaitanya-shakha, a branch both of Chaitanya as well as Nityananda in the desire tree of devotion. He was born in the town of Gauhati (Pragjyotishpur) in modern Assam. His father’s name was Kamalaksha Bhatta. Both of his parents were devotees of Vishnu. When they died, he came with his wife Duhkhini and his brother Hiranya to Mayapur on the shores of the Ganga where they built a home near that of Jagannath Mishra. Jagadisa Pandit became Jagannath Mishra’s very close friend. Jagadisa and his wife Duhkhini had the same kind of parental affection for the little Nimai as Jagannath and Sachi themselves. Duhkhini was like a mother to Nimai and even sometimes acted as his wet-nurse. Nimai, the son of Sachi, is none other than the son of Yashoda, the supreme lord Krishna incarnate. It is not possible for anyone but an eternal associate of the Lord to have the good fortune to treat him like a son in this way. Jagannath Mishra was amazed to hear Nimai say such things. How could he know that Jagadisa Pandit made a rice offering on Ekadasi? Jagannath Mishra immediately went to his neighbor’s house and was surprised to see that a large offering had indeed been made to their Vishnu deity. Jagannath told Jagadisa of Nimai’s request, adding that he was worried that it would not be correct for him to eat rice on Ekadasi day. But Gauranga’s eternal associate Jagadisa Pandit knew that it was little Gopal in the form of Nimai who was hungry. Without any hesitation, he gave the entire offering to Jagannath Mishra. As soon as Nimai received the plate, he immediately stopped crying and joyfully started to eat. Jagadisa Pandit and Hiranya [are Chaitanya’s branches of the desire tree of devotion]. The merciful Lord gave them his grace when he was a little boy. He ate the offerings to Vishnu at their house on the Ekadasi day. Jagadisa Pandit purifies the entire universe because the nectar of love for Krishna pours from him like torrents of rain. The above mentioned pastime is described in the Chaitanya Bhagavat, Ädi-khanda, chapter 4. The Lord grabs the things of the devotee even if he doesn’t offer them, but he shows no interest whatsoever in the gifts of the non-devotee. Just as Mahaprabhu was conquered by the devotion of Jagadisa Pandit, so too was his dearest companion Nityananda Prabhu who considered him to be one of his own intimate associates. Nityananda Prabhu was Jagadisa’s life and soul. Jagadisa was present in Panihati for the Chira-dadhi Mahotsava. Before taking sannyas, Mahaprabhu ordered Jagadisa to go to Nilachala to preach Krishna-bhakti and the religious practice of the age, Harinama-sankirtan. The son of Nanda, Sri Krishna and the son of Jagannath Mishra, Sri Gaurasundara, are the same truth as Jagannath himself. When he arrived in Puri, Jagadisa went for Jagannath’s darshan and melted with love when he saw him. When on his way back to Bengal, however, he felt extreme separation from Jagannath. Thousands and thousands of people go on pilgrimage to Puri every single day. All of them take darshan of Jagannath, but how many of them are overcome by feelings of separation when returning home? Perhaps once in a while some fortunate individual is able to feel such emotions. If one truly feels such pangs of separation, then this is a sign of Jagannath’s mercy; if not, then one has not truly received the grace of the Lord. Jagannath Deva saw Jagadisa crying and so mercifully appeared to him in a dream and told him to take his vigraha and serve it. Simultaneously, he appeared to the king of Orissa and ordered him that at the time of the nava-kalevara, when the wooden deity of Jagannath is changed, the outgoing form should be given to Jagadisa Pandit. Thus, when he met Jagadisa, the Maharaj considered it to be a great honor to give him Jagannath’s outgoing form, which is known as the samadhi-stha-vigraha. Jagadisa prayed to Jagannath, asking him just how he could possibly carry the heavy figure of the deity all the way back to Bengal. Jagannath answered him that he would become as light as a cork; Jagadisa should simple cover him with a new cloth and then carry him with the help of a staff. Jagadisa would have to make permanent arrangements to stay wherever Jagannath was set down on the ground. Jagadisa enlisted the aid of two Brahmins, and they took turns carrying Jagannath as far as the village of Jashora on the banks of the Ganges, near the town of Chakdaha. Jagadisa left Jagannath with one of the Brahmins and went to take his bath in the Ganges. Suddenly, the Brahmin found that Jagannath was becoming very heavy and that he was no longer able to hold him up. Thus when Jagadisa came back from his bath, he saw Jagannath sitting on the ground and realized that the Lord wanted to stay in that very spot. Chakdaha is a historical site and ancient holy place. During the Puranic age, it was known as Rathavarma. Pradyumna killed the demon Sambara there during Krishna’s incarnation at the end of the Dvaparaa age and thus it was known as Pradyumna-nagara. Prior to that, when Bhagiratha was bringing down the Ganga in order to save the Sagara dynasty, he buried the wheel of his chariot here. Thus the town was also given the name Chakradaha, which in time has been transformed into Chakdaha. When the local people heard that the Jagannath deity from Puri had come to stay in Jashora, they flocked there in their thousands to seek his darshan. This is how Jagadisa decided to remain in Jashora rather than return to to his home in Mayapur. Both Nityananda Prabhu and Chaitanya Mahaprabhu visited the Jagannath temple in Jashora on two occasions, being attracted by Jagadisa Pandit and his wife’s parental devotion. They held sankirtan and a feast both times. As the Lord was about to leave Jashora to go to Puri, Duhkhini began to cry from the imminent separation so intensely that the Lord agreed to remain behind in the form of the Gaura-Gopal deity. In the course of the couple’s householder life, they had a son named Ramabhadra Goswami. At first, the deity was kept under a bata tree near the Ganges, and later the king of Krishnanagara, Krishnachandra, had a temple built there for him. Jagadisa Pandit’s temple is currently being managed by the Sri Chaitanya Gaudiya Math.